Trombone Picture Frame – Keep the pictures of your favorite memories protected in this beautiful Trombone Picture Frame. The photo frame features expert craftsmanship and is made with metal trombone that is incredibly detailed. 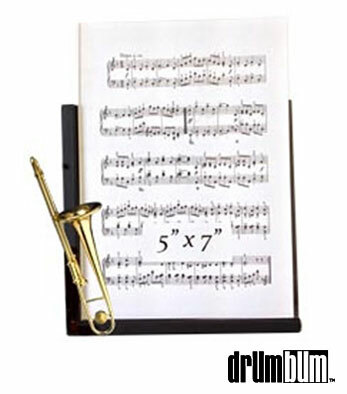 A great gift for any trombone player’s home. Plexi Glass Front is reversible so picture can go either horizontal or vertical. Frame is made of wood and has a folding stand to tilt the frame. Holds a 5″ x 7″ photo. Comes in a gift box.